Formerly 1044, 25Th Cyclist Bn. 8531, 19th Bn formerly 2nd/25th Bn. London Regiment (Cyclists) who died on 1 Octber 1916 age 22. Son of Henry and Mary Apted, of 43, Manchester St., Gray's Inn Rd., King's Cross, London. Dernancourt Communal Cemetery and Extension - III.D.30. Field ambulances used the Communal Cemetery for Commonwealth burials from September 1915 to August 1916, and again during the German advance of March 1918. It contains 127 Commonwealth burials of the First World War. The XV Corps Main Dressing Station was formed at Dernancourt in August 1916, when the adjoining EXTENSION was opened. The 45th and 56th (1st/1st South Midland ) Casualty Clearing Stations came in September 1916 and remained until March 1917. The 3rd Australian was here in March and April 1917, and the 56th from April 1917 to February 1918. The 3rd Casualty Clearing Station came in March 1918 but on 26 March, Dernancourt was evacuated ahead of the German advance, and the extension remained in their hands until the village was recaptured on 9 August 1918 by the 12th Division and the 33rd American Division. In September it was again used by the 47th, 48th and 55th Casualty Clearing Stations under the name of "Edgehill", due to the rising ground on the north-west. At the Armistice, the Extension contained more than 1,700 burials; it was then enlarged when graves were brought in from isolated positions in the immediate neighbourhood and certain small cemeteries, including:- MOOR CEMETERY, EDGEHILL, DERNANCOURT, was about 800 metres West, near the top of the hill. It contained the graves of 42 soldiers from the United Kingdom who fell on the 23rd-25th March, 1918. 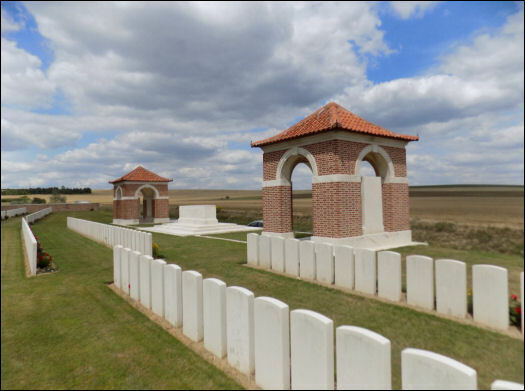 ALBERT ROAD CEMETERY , BUIRE-SUR-ANCRE, was nearly 3 Kms West, on the straight road from Amiens to Albert. It contained the graves of 65 soldiers from the United Kingdom and 33 from Australia , who fell in April-August, 1918. It was made by Australian units and by the 58th ( London ) and 12th Divisions. The extension now contains 2,162 Commonwealth burials and commemorations of the First World War. 177 of the burials are unidentified, but there are special memorials to 29 casualties known or believed to be buried among them, and to two buried at Albert Road Cemetery , Buire-sur-Ancre whose grave could not be found on concentration. The extension was designed by Sir Edwin Lutyens. Dernancourt is a village 3 kilometres south of Albert. The Communal Cemetery is a little west of the village, and the Extension is on the north-west side of the Communal Cemetery .